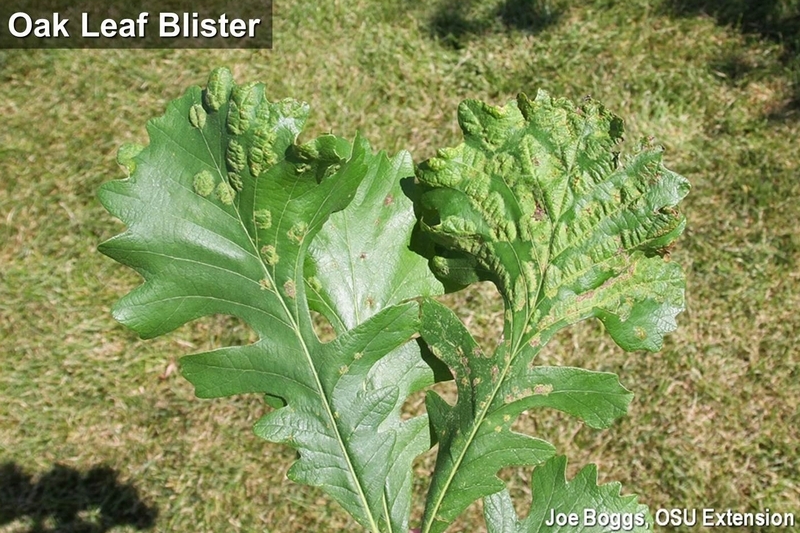 Oak leaf blister is a disease is caused by the fungus, Taphrina caerulescens. The fungus overwinters in infected buds and twigs. Leaf infections occur during moist periods in the spring as leaves emerge. Early symptoms appear as raised, blister-like, light-green to yellowish-green spots on the upper leaf surface matched with deep depressions on the lower leaf surface. Eventually, the leaf "blisters" become very apparent as they turn dark brown to brownish-black. The blisters may be evenly distributed across the leaf and are distinct from the angular, vein-based symptoms produced by oak anthracnose. Although the obvious blisters may reduce the aesthetic appeal of heavily infected trees, the disease typically causes little harm to the overall health of the trees. Even leaves with a relatively large number of infections will retain a significant percentage of functional tissue for photosynthesis. Thus, control measures are generally not required.